Below are some of the upcoming events offered in our area through our Association, the Boardman River Nature Center, Plant It Wild, and The Botanic Gardens at Historic Barns Park. Check each of their websites for even more summer fun. Most, if not all, of these events earn either education or volunteer hours. MGANM presents “Smart Gardening For Soil Health” with special guest Dr. George Bird from Michigan State University. Dr. Bird will share best practices in the garden to keep your soil healthy. Dr. Bird is a professor in the Department of Entomology at MSU and former Research Scientist, Agriculture Canada and Associate Professor, University of Georgia. Dr. Bird became a faculty member at MSU in 1973; where he teaches and does research and Extension outreach on sustainable and equitable development in regards to food systems, with special reference to soil health biology. Dr. Bird is a recipient of the MSU Distinguished Faculty Award, a 19-year member of the Rodale Institute board of Directors and the first National Director of the U.S. Sustainable Agriculture Research and Education Program. All Master Gardeners and the public are invited. A $5 donation from non- members is appreciated. MGANM presents Designing with Natives for Fall Color with Brian Zimmerman of Four Season Nursery and Brian Zimmerman & Associates. Brian Zimmerman & Associates was formed in 1996. The focus is design & build residential landscape projects, both new and remodel, large or small. Brian is a third generation landscape contractor in the Traverse City area, having spent 24 years working for his father before starting his own company. His biggest joy is being a part of the project from the initial meeting & design to bringing it all together. Mark your calendars for Sunday, November 4th. The Recognition Luncheon event is rewarding as it brings together MGANM members and MG volunteers to celebrate the accomplishments of the last year, enjoy a delicious meal, hear a speaker, and enjoy the company of other gardeners. Earn volunteer hours by participating in event planning, set-up, table decorations, and the like. End the season on a high note! Vern Stephens of Designs by Nature will share his expertise in propagating native grasses and establishing grasslands. Native plants will be available for sale. 6:30 – Potluck – Bring your table service and a dish to pass. Brief business meeting. Come on out to the beautiful grasslands at Arcadia Dunes for a species ID and seed collection event hosted by GTRLC’s own Angie Lucas, with help from Plant it Wild and Benzie Audubon. Dress for the weather and wear comfortable shoes. This event will be held rain or shine! Walk with Paula Dreeszen to see all the eye-popping Michigan native wildflowers in Pete’s Woods. Fabulous Spring hike. Location: GTRLC’s Pete’s Woods Trailhead on Swamp Rd. Visit the greenhouse with growers Paul and Jody Zemsta. They will explain their propagation practices and have plants to sell. Cheryl Gross will host a presentation on the state of native plants in the US and abroad. Come and learn about what other areas/gardens are doing with natives. Trinity Lutheran Church, 955 James Street, Frankfort. Join Paula Dreeszen on a 1.5 mile hike to see dunes wildflowers. Possible Yellow Lady Slippers? Location: GTRLC’s Mt. Baldy Trailhead. M-22. Manistee Conservation District & PIW host plant sale with Vern Stephens of Designs by Nature. MCD Fund Raiser. Great plants! Carolyn Thayer will present the current findings, research, and methods to protect pollinators. As up to 2/3 of our food requires insect pollination, learn about this important topic. Meditation at the Garden classes continue with Stephen and Theresa Bangle! The $20 fee covers all four sessions. The Bangles will be donating all proceeds back to The Botanic Garden! Join us as Patti Travioli, owner of Heartwood Forest Farm, guides us through techniques for extending our growing season including greenhouses, hoop houses and cold frames. Join us for this fun, informative and fast paced presentation as Ben Cohen, owner of Small House Farm, shares seeds and stories while discussing how to build a stronger, more sustainable seed community. Demystifying Bonsai: Please DO try this at home! Hear Linda Schubert and Janet Kivell guide us through demystifying bonsai! Join us as beekeeper Alta Walters discusses the many threats to bees and shares ways we can help combat and prevent these threats. This presentation is in collaboration with Crosshatch Center for Art & Ecology. Please join us for Colantha’s Garden Celebration at Historic Barns Park and enjoy an afternoon of family fun and special activities to mark the harvest season and the beginning of a new school year. — it’s free! Dr. Nate Walton, our MSU-E Consumer Horticulture Program Instructor, shared his knowledge of Smart Pest Management. He explained how chemical pesticides were developed after WWII which worked for a while, then became ineffective and new pesticides were created. Thus new chemicals are constantly being developed. These days we are on the lookout for organic and non-toxic (to humans, bees, animals) methods to help us control garden and yard pests. Nate talked about the Japanese Beetle, Squash Bug, Rose Chafer, and the Colorado Potato Beetle. He also discussed non- chemical ways of trying to control pest damage such as crop rotation, watering wisely, netting and modifying the plant environment. Nate’s informative discussion was helpful and hopefully will lead us to better pest management in our gardens, small and large. Thanks so much Nate! There is certainly no shortage of invasive plants in northwest Michigan and most people are aware of the common species. Garlic mustard, invasive phragmites, Japanese knotweed, and autumn olive are just a few names that typically make one groan in frustration. These plants love to grow in disturbed areas, create dense stands, and out-compete many native plants which is detrimental to pollinators. However, at the Northwest Michigan Invasive Species Network (ISN), there is another category of plants known as “Early Detection” species. These are plants that have not yet been identified in the region but if they do appear, they immediately become a priority. The goal is to treat them as soon as possible, before they are given the chance to spread and become difficult to manage. Early detection species in our region include amur cork-tree, black jetbead, butterbur, flowering rush, giant hogweed, and several others that are listed at www.habitatmatters.org. Another plant on that list is black swallow-wort and unfortunately, it was recently identified throughout the village of Kingsley after it was brought to ISN’s attention by a concerned citizen. Thorough surveying in the days following have revealed that the plants are growing beyond a single population and it will require community partnership to successfully tackle management. Black swallow-wort grows extensively in southern Michigan and is found in Emmett County and into the Upper Peninsula. This population in Kingsley is the first one that has been identified in our region. While it shares the same characteristics as the aforementioned species that classify it as an invasive species, it has an additional trait that makes it especially concerning. Swallow-wort is a member of the milkweed family and acts like a “sink” for monarch butterflies. Even when native milkweed species are present, female monarchs will often lay their eggs on the invasive variety. Once the eggs hatch, the caterpillars are unable to feed on the plant and die. Swallow-wort can quickly spread over an area if not managed and ISN needs your help to get started! Most of the populations in Grand Traverse County have been identified on private property and we are seeking individuals who are willing to advocate for the plant’s removal and to share ISN’s messaging in relation to swallow-wort and its potential impact on monarch butterflies. If you are interested in helping, please contact ISN Communications Specialist Rebecca Koteskey, rkoteskey@gtcd.org. Identifying additional populations is also key and often, just as with this case, ISN needs input from community members! If you think you are aware of a black swallow-wort population, please contact us at (231)941-0960. Often called black dog strangling vine, it tends to climb around adjacent plants. One is more likely to notice it’s oblong, narrow, dark leaves which are somewhat waxy, over its flowers which are purple and tiny. Additional photos can be found at www.misin.msu.edu. It is also important to note that there is a pale swallow-wort which looks and acts the same but has pale pink flowers – keep an eye out for this species as well! It’s Summer…Get Out in the Garden! On May 1 our guest speaker was Rebecca Krans, the Consumer Horticulturist from our MSU Extension office in the Upper Peninsula. She offered a long list of procedures and ideas for Smart Vegetable Gardening. Smart Gardening is MSU Extension’s campaign to equip gardeners with science based, earth friendly and best practices for good soil and good crop yields. Rebecca shared ideas of why people don’t plant vegetable gardens and then some steps in setting up a garden including planning your site, size, lighting, location and what types of things you’d like to grow. Also helpful is knowing which crops are cool-weather growers and which do best during the mid or warm season. This makes it possible to plan successive plantings for maximum yield. Rebecca also gave suggestions for making your own compost, types of fertilizer, and various types of gardens. We appreciate your veggie garden knowledge, Rebecca, and thank you for sharing it with us! Some botanic gardens in Michigan are well known, such as Matthaei Botanic Garden at the University of Michigan in Ann Arbor, Frederik Meijer Gardens and Sculpture Park in Grand Rapids, and Michigan State University Horticulture Gardens in East Lansing. But our state is home to some fantastic lesser-known gardens as well. Here are just a few you might consider adding to your summer travel plans. 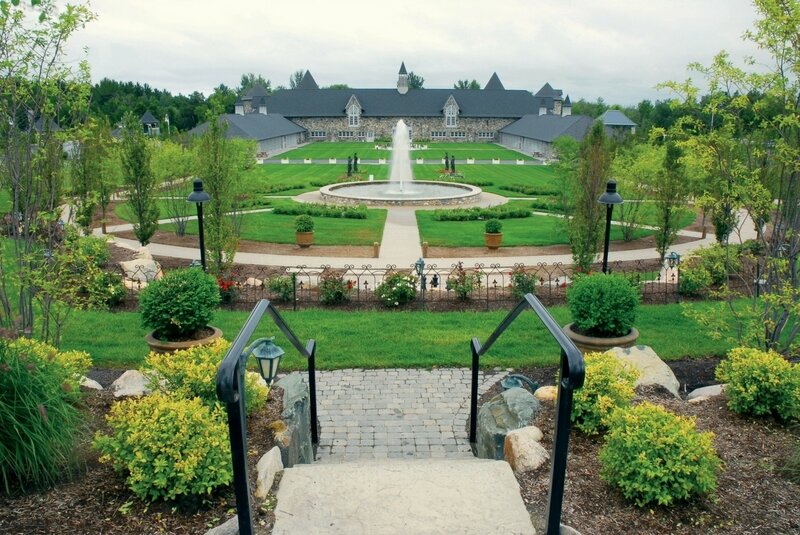 With a 2002 renovation, Castle Farms in Charlevoix (www.castlefarms.com) now boasts a number of gardens to explore. Using native plants when possible, guests can stroll through the formal Butterfly Garden, East Garden with croquet and a small fountain, Alphabet Garden (a favorite with kids), Serenity Garden, and the King’s Grand Courtyard, a Renaissance garden based on the landscape at Chateau de Vaux-le-Comte in France. Both self-guided and guided tours are available-with a tram for transportation on a schedule. Hours and admission fees vary throughout the season. The seed (well, tuber actually) was planted for Dahlia Hill (www.dahliahill.org) of Midland in 1966 with a Mother’s Day gift. Now home to 3000 plants of over 300 varieties of dahlias maintained solely by volunteers, this garden is open dawn to dusk and admission is free. Comprised of eight stone terraces, each variety is labeled along gravel pathways. Four aluminum sculptures can be found; the work of local Midland artist Charles Breed, who planted those first tubers. His working studio and museum is located on the grounds as well. There are two raised planters at the top of the terraces, one a donor garden and the other a memorial garden, where loved ones’ ashes can contribute to the growth of a beautiful dahlia plant. Each of the 20 dahlia petal forms are represented. Mark your calendar for the last two Saturdays in May next year – their extra tubers are offered for sale then. The garden has been the recipient of the Keep Michigan Beautiful President’s Plaque and a President’s Award from The American Dahlia Society. Not far from White Cloud, within the Huron-Manistee National Forest lies the Loda Lake National Wildflower Sanctuary (www.fs.usda.gov/recarea/hmnf/recarea/?recid=18706). 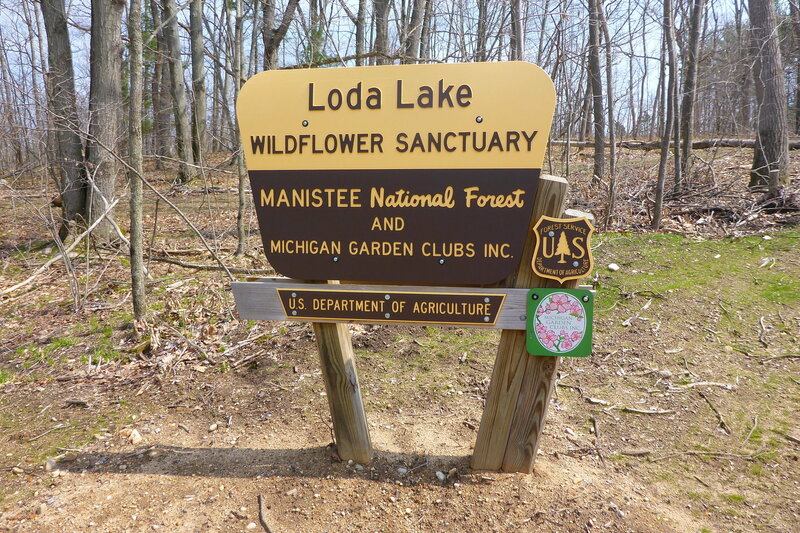 This is the only Wildflower Sanctuary located within a National Forest and has been funded financially and materially by the Federated Garden Clubs of Michigan for over 70 years. A variety of ecological systems are supported here, including wetlands, marsh, creek, spring-fed lake, pine plantation, oak forest, and an old farmstead site. Amenities available are a self-guided 1.2-mile wildflower trail, cultural trail, birder’s checklist, picnic area, small boat launch, and a pollinator garden. Docent-led walks and environmental curriculum for groups are available via the National Forest Service Baldwin District Office. Fernwood Botanical Garden and Nature Preserve (http://www.fernwoodbotanical.org/) began in 1941 when the first 12.5 acres were purchased by Kay and Walter Boydston as their country home. Kay’s passion for horticulture, crafts, and nature were attractive, drawing others to the property. There is a story told of Kay often planting into the darkness of the evening using her car headlights to illuminate her work. Local Niles area philanthropists facilitated the land becoming public and additional land purchases grew the property to 105 acres. Today, one can find a nature preserve, nature center, arboretum, conservatory, prairie, and gardens – which include a Railway and Nature Adventure Garden, Japanese Garden, Herb and Sensory Garden, and more. Ten trails of varying length and simplicity invite investigation and reveal an abundance of native wildlife. There is a garden shop and cafe, and numerous educational programs are available, including activity backpacks for the young and not-so-young to check out during a visit. There is a nominal admission fee, and groups are welcomed and offered a discount with advance purchase. With all these blooms and plants waiting your arrival, plan your trip and get out into the garden. Deadheading your garden flowers will help keep the area neat and tidy as well as promote and prolong flower blooms. An additional benefit is its help in controlling reseeding/spreading and crowding in the beds. Deadheading can be an overwhelming task as it was in the flower beds at the school where I taught. The daisies and coreopsis were beautiful until it was time to deadhead and of course no one was around to do it. The trick is to do a little bit several times a week throughout the growing season. It’s best to start to snip when the flower begins to decline, which might be a change of color or loss of petals. Weather; heat, rain, or lack of it, can affect the longevity of your various perennials and annuals. It is generally easiest to remember to prune spent flowers and stems to a point where there is a new lateral leaf or flower bud. If there is no new flower showing, cut the stem to a lateral leaf. Some plants need a shearing with scissors as flowers bloom and fade at the same time. There are also plants that don;t need to be pruned at al as the do not rebloom. These include sedum, vinca, astilbe, and peony, just to name a few. Some flowers are easy to pinch off with your fingers, others with thicker stems will require scissors or hand pruners. And of course the more flowers you cut and bring in to enjoy inside the house means less deadheading in the long run! On April 29th, 21 volunteers participated in a work bee at Munson Hospice House. Our group included rosarians from Cherry Capital Rose Society (CCRS), Hospice House Volunteers, and Master Gardener volunteers. We started with an excellent demonstration of how to prune and maintain Knock Out roses. The CCRS members guided each person as we pruned 100 rose bushes! We fertilized with a special rose amendment made and donated by CCRS. After the roses, sick ornamental trees were addressed. Master Gardeners pointed out the symptoms of black knot fungus and showed how to prune the trees in the garden. A delicious lunch was enjoyed as we shared our stories of how we got involved with the Hospice House garden. Then we finished the day by weeding, cutting down grasses, and doing general garden clean up. The Hospice House volunteers were eager to learn about these tasks and discuss a schedule for regular maintenance of the garden. This garden had been tended sporadically over the last few years and needed rescuing. This hardworking day was a great start toward the goal of getting the garden back to the peaceful place of natural beauty that the hospice patients and their families deserve. Last fall I heard about an opportunity to work on installing landscaping at a Habitat for Humanity home in the Depot Neighborhood in Traverse City. At the end of the day, the timing did not work for me. I did, however, ask to be kept on their radar for another home. The Fife Lake landscaping project finished June 20th. The project began on a site visit with the prospective homeowner, her mentor, and the construction manager. Together we examined the site and the existing plants, which included a lot of Michigan yellow sand and a few invasive species. The prospective homeowner had done her homework and gave me a list of plants she liked. She explained very clearly that she liked things symmetrical, wanted an abundance of blossoms and her favorite plants were day lilies and bushy roses. I talked about the soil, sun, and the benefits of including native plants. Next step was a nine-page summary report of the site and possible plants including pictures and characteristics. The report included information on lawn seeding and container planting as well. An investigation and summary of the prospective homeowner plant lists revealed that many of them were not hardy to Zone 5 and explanation of each plant was provided. Habitat for Humanity and the prospective homeowner then began to acquire plant material. Pine Hill Nursery generously donated some native perennials and lavender. The Habitat for Humanity’s partner nursery offered none of the plants on our desired plant list but donated five other shrubs and lavender. Once the plants were acquired, the prospective homeowner described how she wanted them planted. This was a difficult stage in the process for me. The plants available did not necessarily ‘fit’ in her desired location. For example, she wished to have a shrub between the porch and entry walk in a space no more than 18-24 inches deep. Also the drip lines of the roof needed to be considered to protect the shrubs from snow damage. Again, researching each plant donated, information describing the growing habit of the plant was presented. This brought us to install day. Nine women from Century 21 Realty volunteered for a day of service. The day dawned sunny and seasonably warm and the soil retained some moisture from the heavy weekend rain. It was perfect. I laid plants in place and waited for the prospective homeowner to arrive and rearrange things to her vision. The realtors got to work digging invasive honey suckle, pulling garlic mustard, removing myrtle and rescuing sedum. They were amazing; hard working and very efficient. The prospective homeowner arrived and made her tweaks to the plant arrangement. In no time at all, plants were in the ground, a bit of compost added to the shrub holes, the sedum was used as filler between shrubs as we wait the plants to grow, and a top dressing of mulch was added. Landscaping added an incredible visual to the house. Wrapping up the project, it made me sad that the prospective homeowner did not have the two plants she most wanted, day lilies and bush roses. So, I got my hands on a smaller form day lily, the gold one that is so common and purchased a Drift rose. It was all worth it. My role in this project was educational only. With the number of volunteers taking a day from their jobs to support Habitat for Humanity, it was important that they keep busy with hands-on work. I am confident that each individual involved in landscaping this Habitat Home gained more than they gave. I certainly did.